Somalia’s Puntland, forms the tip of the Horn of Africa and of course lies in strategically important region where people once experienced protracted strife but more recently made a history with rare move. 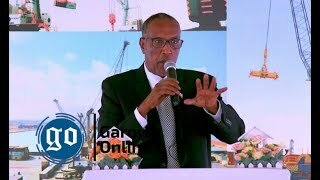 Given the landmark achievement at home and abroad during his incumbency as the President of Puntland, without question and beyond the doubt, Dr. Adirahman Mohamed Farole is the person of the year. The Credible and transparent presidential election in January 2014 and how Dr. Farole gracefully conceded defeat demonstrated his statesmanship and his sense of patriotism in an indirect election in which the winner failed to triumph with comfortable margins. 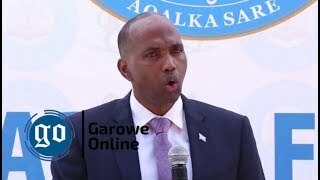 The incident went down in the history as milestone, with some African leaders, popular politicians and international media portraying Farole as symbolic and new Somali icon who emerged as the second Adan Adde of Somalia. Contrary to the general feeling among the Somali people, his sudden concession within a minute after he lost the election by one vote captured the attention of the international community. Why was he different from predecessors? Abdirahman Farole became the only President who handed over well-equipped palace, legitimate documents, weaponry and strong army, a brilliant legacy that has never been observed before. Meanwhile Farole will forever be remembered for historic initiatives that positively impacted Puntland People and Somalis at large. In Puntland, he was the first president who came up with the idea of new emblem, the state flag and adopted the first-ever more permanent constitution as Puntland had since been complying with transitional clauses. Over the course of his tenure of office, Dr. Farole built institutions in shambles from the scratch and set up state agencies. 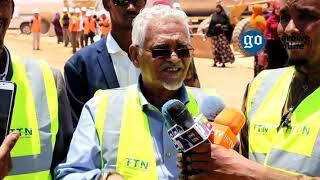 Ministries complex, parliament house and Puntland State House are among the remarkable achievements. 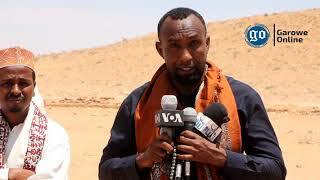 On economic infrastructure, Abdirahman Farole undertook extensive efforts to boost the aviation sector with the construction and renovation of Bossaso and Garowe airports, launched State Radio and Television and beatified towns under UN Joint Program on Local Governance. In step towards a truly democratic state, former Puntland President announced Transitional Puntland Electoral Commission (TPEC), widened the space for rival political associations, introduced Electoral Commission bill in 2011 and cooperated with Democratization Programme Steering Committee (A group of seven donors that included EU, US, UK Norway, Sweden, Denmark and Switzerland) on the long-awaited dream. Somalia and the Federal State of Puntland enjoy the breakthrough advances yielded by Puntland Maritime Police Force (PMPF) and the apparently coordinated offensives against Al Shabaab militants in Galgala hideouts. Following destructive measures by political spoilers in Puntland, President Farole suspended the campaign for local council elections on July 15, 2013. The attempt was the first democratic vote in 44 years. At the time, mobs set ballot boxes, other equipment and tires on fire and killed senior army commander. Taking peaceful environs and durable coexistence into account, Farole refrained from using force and directed security forces in charge of the matter to exercise restraint. Former Puntland President, Dr. Farole put the northeastern state in the international spotlight and made historic appearances in international forums. Puntland for the first time participated in conferences on Somalia such as New Deal Somalia compact in Belgium and Dr. Farole delivered a key speech touching on urgently pressing issues ahead for Somalia. At official invitations, Farole addressed US congress and Indian Parliament and attended security gatherings in the neighboring countries. He twice hosted National Consultative Constitutional Conferences in Garowe and emerged as influential player in the course of the country’s timetable towards end to transitional period. Dr. Farole took a leading role in the country’s loose federalization process by helping Jubaland stand on its feet and at the same time encouraged the formation of federal states in central and southwestern Somalia. 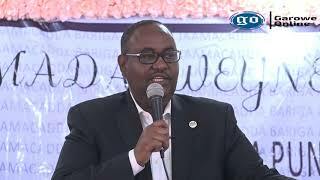 In light of the tremendous work and developments Somalia and Puntland registered during his tenure of office, Garowe Online News Agency declares Dr. Abdirahman Mohamed Farole ‘Person of the Year’. 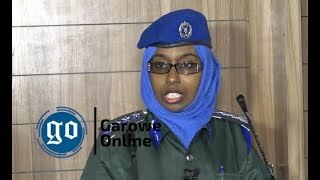 Garowe Online Editors, Staff Writers and the board members have screened quite a few Somali politicians with a track record for good governance for the coveted award ‘2014 Person of the Year’.